Social Change Media provides a website requirements survey service to help you quantify the content preferences and issues of your users. Surveying your stakeholders or users is the best way to ensure your new website will meet their needs. It's also an effective way to discover any issues or good ideas that you might like to address or include in your new website. Not surveying your stakeholders or users leaves you open to not delivering what they want in your new website or failing to address their issues with your current website. Surveying your stakeholders or users is the best way to ensure your new website will meet their needs. Ideally, you should conduct a workshop to discover their issues, so that the importance of these issues can be measured quantitatively with your survey. Social Change Media Principal Consultant Mark McGrath has extensive experience in designing website requirements surveys, analysing results and making recommendations that will address the needs of your stakeholders or users. author a findings report that includes recommended solutions to identified issues. Our standard cost for a 10 question website requirements survey is $3,200.00 ex-GST. This cost excludes any survey promotion. We have recently conducted a stakeholder survey for the Queensland Mental Health Commission. 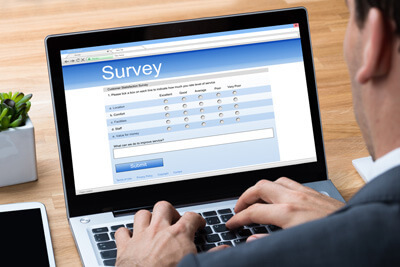 Please request a quote if you are interested in our website requirements survey service.